Athletic Performance: Citrulline, Arginine and high intensity exercise performance. 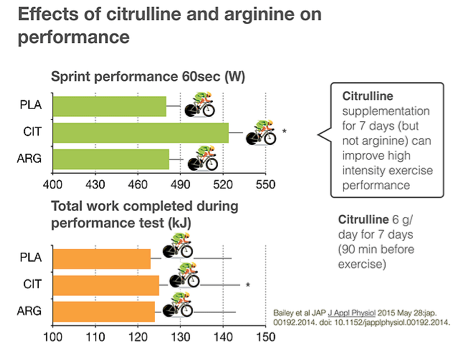 The effects of Citrulline and Arginine on performance. 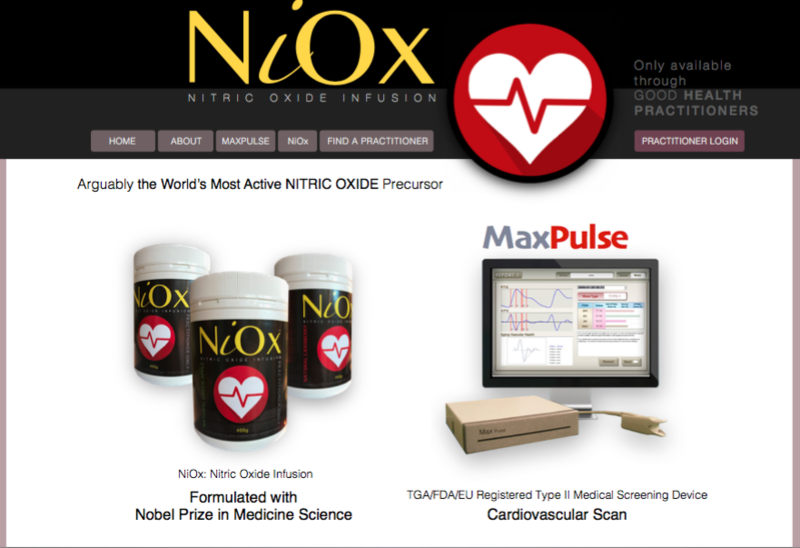 Nitric oxide (NO) is a very small but very important molecule in the human body. It plays a crucial role in many processes in the body. For example it is known that nitric oxide plays a role in the regulation of blood flow and blood pressure amongst many other functions. Nitric oxide is made in the body from nitrites and nitrites can be made out of nitrate (from beetroot juice for example). 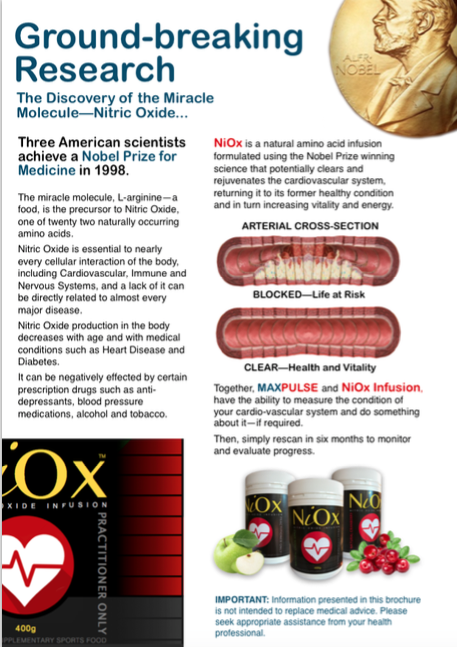 Nitric oxide is also made from the amino acid arginine. It is often suggested that arginine supplementation can help NO production. The problem is that most of the arginine is broken down or converted before it reaches tissues. It is estimated that only 1% of ingested arginine is available. Another way to increase arginine in the body could be to ingest citrulline. This is not broken down but is converted in the body to arginine. Studies with beetroot juice (a dietary source of nitrate) have suggested beneficial effects for athletes. 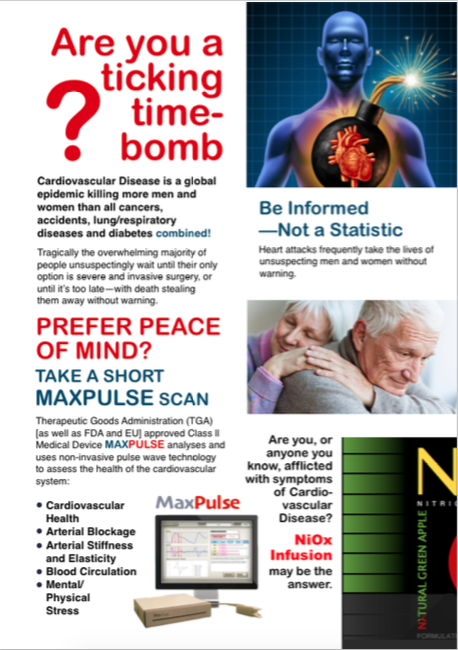 Studies have shown that dietary nitrate supplementation can increase NO biomarkers (suggesting NO has indeed increased), reduce blood pressure and improve exercise economy/efficiency and exercise tolerance in healthy adults. There is however, a continuing search for other ingredients that can stimulate NO synthesis. A recent study at the University of Exeter led by Dr Stephen Bailey investigated the possible role of citrulline and arginine. Ten healthy adult males completed moderate- and severe-intensity cycling exercise on days 6 and 7 of a 7 day supplementation period with placebo, arginine or citrulline. The order of the trials was randomised, the study included a placebo and all subjects performed all trials (cross-over study). Blood pressure was measured as well as blood arginine and nitrite concentrations. The performance test was a test that consisted of 10 min all-out exercise with a sprint in the last 60 seconds. Performance was measured as the total amount of work performed in the test as well as the ability to sprint at the end. The first notable finding was that both arginine and citrulline resulted in elevated arginine concentrations in the blood. Blood pressure was only lower with citrulline supplementation but not with arginine. Citrulline also improved tolerance to severe-intensity exercise and increased the total amount of work completed in the exercise performance test. Arginine supplementation had no effects on blood pressure or performance. The authors concluded that these results suggest that 7 days of citrulline (6g/day), but not arginine supplementation can improve blood pressure and exercise performance in healthy adults. SJ. Bailey, JR Blackwell, T Lord, A Vanhatalo, PG Winyard and AM Jones L-citrulline supplementation improves O2 uptake kinetics and high-intensity exercise performance in humans. J Appl Physiol 2015 May 28:jap.00192.2014. doi: 10.1152/japplphysiol.00192.2014. * Prof. Dr. Rainer Böger, head of experimental medicine at the University of Hamburg, is the world’s highest published scientist on Nitric Oxide and with over 25 years research on L‑arginine, has established the efficacy of these L‑arginine and L‑citrulline ratios. With even a cursory glance into finding the most effective L‑arginine to get the important result you’re needing you could soon become confused by the array of different types and combinations of L‑arginine available. L‑arginine is often consumed by body-builders because it promotes body muscle mass when used just prior to a workout which adds even another layer of confusion. You’ll also most likely become confused about the many other ingredients and combinations as you endeavour to work out which L‑arginine is best for reversing CVD. for example, that L‑arginine vasopressin, is different from L‑arginine, with an entirely different essential structure and purpose. NG‑monomethyl‑L‑arginine, is also different from L‑arginine as it functions as an inhibitor of nitric oxide synthesis. L‑arginine hydrochloride has a high chloride content used to treat metabolic alkalosis. All are sold under the L‑arginine banner. And that’s without all the other ingredients that so often get added for the cardiovascular market, supposed to help. But do they? 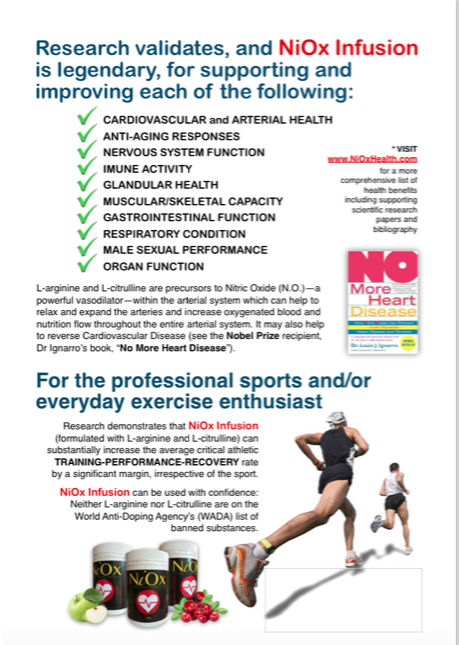 Even L‑arginines developed specifically for the cardiovascular market usually include propriety ingredients that predominantly, in reality, in reality, do little or nothing to promote heart health, but more tell a story to justify them being there (i.e. create market differentiation) to set that product apart from competitors. You will often discover that many of these products have as much as 50% or more extra ingredients to the L‑arginine base they promote. However all these ‘bells and whistles’ are mostly not at all necessary for achieving the desired outcome, plus the end product often becomes very expensive as a result, especially if they are network marketed. Another important point often missed is that almost all of these products contain a significant amount of sugar (in various forms) in order to assist hiding the noxious taste of L‑arginine. This ultimately contributes to unwanted and unhealthy body weight/fat. Something we don’t want, especially as we age. 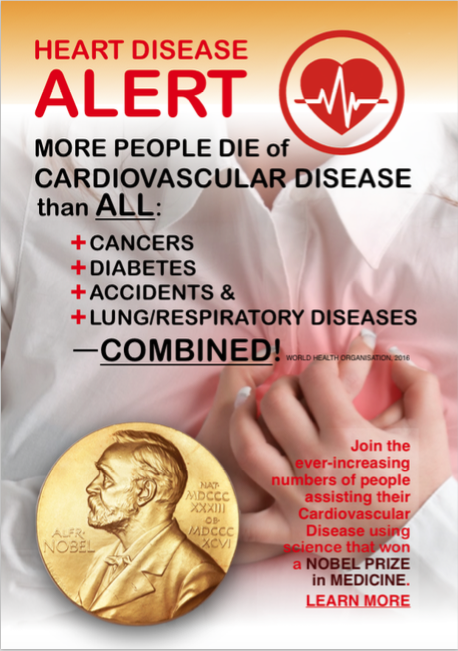 For the purposes of reversing cardiovascular disease and regenerating optimum health and wellbeing, L‑arginine is best used in as close to its unadulterated form as possible, that is, not a proprietary blend of sometimes dozens of added ingredients. Minimal flavoring to mask the ‘vomit’-like taste of raw L‑arginine is certainly acceptable, but not unnecessary (and cheaper) ‘fillers’. A down-side to L‑arginine is that once it converts to Nitric Oxide (which is the form it takes once ingested) it doesn’t last very long. One solution to this is finding a combination of L‑arginine with another amino acid, L‑citrulline, which very helpfully effectively “turbo charges the result. L‑citrulline also increases the duration of L‑arginine’s activity in the body, and therefore the resulting Nitric Oxide. In an ideal world, the best way to take L‑arginine is in its natural form. However, very few people can tolerate swallowing even the smallest dose as the taste is something akin to a combination of off-fish and vomit. Not joking! Plain L‑arginine may appear cheaper in the short term but is a waste of time and money as it is highly unlikely you will be able to maintain using L‑arginine in the quantities required for long enough to achieve therapeutic results. If it doesn’t save your life, what’s the point of taking it at all? There are tablets available but I quickly discarded the option of taking L‑arginine in tablet form as they contain large amounts of fillers to hold the tablet together. Capsules on the other hand deliver 100% product, however they are also the most expensive after everything is compared. You also need to swallow a great number of them at once, a number of times a day, to achieve the NO saturation level necessary. So capsules are not the answer. A very significant downside to taking L‑arginine is that it doesn’t stay effective long once it’s digested into the body—roughly about 10 minutes. However, when combined with another amino acid, L‑citrulline, it can last hours. NiOx has been formulated with the exact version of vegetable-derived L‑arginine (not from a chemical concoction in a laboratory) that best suits the metabolic process required for the most effective result, as well the exact percentage of L‑citrulline to gain the maximum effect. The most efficient, effective and affordable long term way of taking L‑arginine/L‑citrulline is in powder form with just enough natural fruit flavor and natural no-carb sweetener to mask the taste, taken in water and drunk throughout the day, every day. That’s NiOx.